Shoyu Ramen at Ramen Gaijin in Sebastopol. Photo courtesy of Heather Irwin. Smoked fish salad at Ramen Gaijin in Sebastopol. Photo courtesy of Heather Irwin. Sesame ice cream with miso caramel at Ramen Gaijin in Sebastopol. Photo courtesy of Heather Irwin. 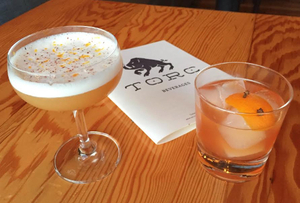 Torc restaurant in Napa has new happy hour offerings including the Midlife Crisis cocktail and the Face Melter quesadilla. Photo courtesy of Torc. BYO dinner, decorations, and booze? Yup, it’s a Sonoma Valley pop-up from Hand Made Events. Photo courtesy of Hand Made Events. 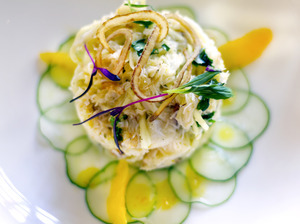 Dungeness crab salad from new chef Andrew Wilson at Dry Creek Kitchen. Photo courtesy of Heather Irwin. 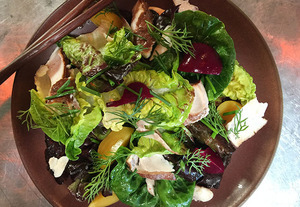 Charlie Palmer’s Harvest Table opened this week in St. Helena. Photo courtesy of Harvest Table. 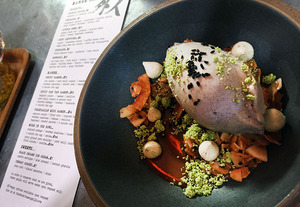 ~RAMEN GAIJIN~ chef Matthew Williams isn’t quite sure why his Sebastopol noodlery recently got called “white guy ramen” by the notoriously opinionated Richie Nakano of SF’s late Hapa Ramen. So, okay, Williams and co-owner Moishe Hahn-Schuman are white guys, and their restaurant is called Ramen Gaijin (the Japanese term gaijin refers to a non-Japanese person, or foreigner), but when you’re cranking out some of the best ramen in the Bay Area, well, people tend to take potshots regardless of how good your food is. That’s unfortunate, because Williams and Hahn-Schuman are ramen savants, meticulous in every detail of this exceedingly complex noodle soup. In fact, the two just bought Nakano’s (allegedly) $60,000 Japanese noodle maker for their own Sebastopol shop, cutting their backbreaking six- to eight-hour in-house noodle-making process to mere minutes. Additionally, Ramen Gaijin sources their vast lineup of ingredients from small local farmers and coastal fishmongers and craft everything from karaage to their signature shoyu ramen with patient hands. This ain’t no assembly-line ramen. So what’s with the swipe? Meh. The guys take it in stride, saying that they stand behind every single bowl they serve as being as true to its regional inspiration as possible. 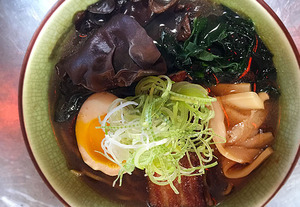 Frankly, I’d be willing to bathe in every single rich, umami-laden, pork belly-filled bowl. Because I’m loyal like that. 6948 Sebastopol Ave. (near Main), Sebastopol, 707-827-3609. Crack open Memorial Day weekend with a rocking and slurping good time at ~ROCKER OYSTERFELLER’S~ annual Oysterpalooza. With more than a hint of NOLA in its soul, this celebration of the bivalve features five bands on two stages along with a mollusk-heavy menu of barbecued oysters, fried oyster po’boys, red beans and rice, barbecued brisket, Hurricanes, and more surprises. Tickets are $20 in advance, $25 at the door, and kids 6-12 are $10. Tickets and details online. 14415 Shoreline Highway, Valley Ford, 707-876-1983. 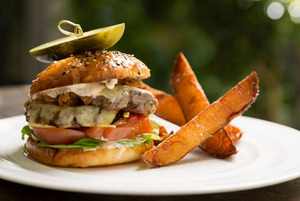 Raise a glass to downtown Napa, which just got twice as happy with new happy hour menus. ~TORC’S~ daily happy hour from 5-6:30pm features $5 bites, including the “Face Melter” quesadilla with short ribs, Bengali sweet potato pakora, deviled eggs with pickled onions and bacon, and $6 cocktails like the Midlife Crisis (vodka, Dimmi, lemon, peach, and elderflower). 1140 Main St. (near Pearl), Napa, 707-252-3292. ~FAGIANI’S~ has a new Land and Sea happy hour Tuesday through Friday from 4:30pm-6pm, featuring $1 oysters; $6 plates of charcuterie, steak tartare, or Scotch egg; and weekly martini selections. 813 Main St. (near Third St.), Napa, 707-226-7821. Eat for Nepal: Santa Rosa newcomer ~YETI RESTAURANT~ serves up a special prix-fixe meal on Tuesday May 19th to benefit earthquake relief efforts in Nepal. The cost of the dinner is $29.99 per person and half the proceeds will go to NEWAH, a nonprofit focused on providing access to clean water in Nepal. Call 707-521-9608 for reservations. 190 Farmers Lane, Santa Rosa. What do you call a pop-up dinner where you have to bring your own food, wine, and table decor? 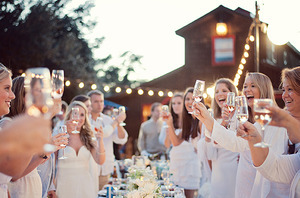 Hand Made Events, based in Sonoma, calls it a party. After sellout events in SF, LA, and Brooklyn, the company is bringing their unique concept to Wine Country on Saturday May 23rd. What makes the experience so much fun? It’s an exercise in creativity and community. Groups of guests are guided to a secret location (in this case somewhere in the Sonoma Valley) a few hours before the start of the event. Wearing chic all-white ensembles, friends collaborate on the menu, the table decor, and the drink list, with just two hours to set up before the 7pm dinner. The whole evening ends with entertainment and dancing. “We are so happy to bring PopUp Dinner back to our hometown.” said Nicole Benjamin, co-founder of Hand Made Events. “Sonoma is a place known for its exceptional beauty, food, and wine, so it truly is the perfect location.” Tickets are $38 per person (remember, you bring all your own food and drink) for a night with hundreds of new (and old) friends under the stars of the Valley of the Moon. After the event, you get to truck out all your own stuff as well, leaving no trace behind. Details and tickets online. It’s been a busy year for Charlie Palmer. 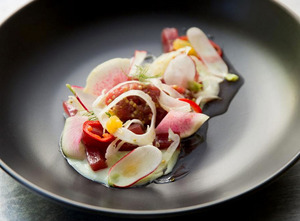 First he installed Andrew Wilson as the new chef at ~DRY CREEK KITCHEN~ in Healdsburg (which btw is going swimmingly). Next it was the spring release of his new cookbook, Charlie Palmer’s American Fare, and yesterday, the opening of his second Wine Country restaurant, ~HARVEST TABLE~ in St. Helena. So far, the buzz is hot for exec chef Levi Mezick’s take on Wine Country cuisine, with dishes like roasted carrots with buttermilk, vadouvan, and granola; the Harvest Table burger with fontina cheese; and whole roasted truffled chicken with Parmesan polenta and morel mushrooms. Pastry chef Andrew DiClementi, most recently of Dry Creek Kitchen, is turning out his signature chocolate peanut butter bar with dark chocolate marquise. Hours are lunch Wed-Fri 11:30am-2:30pm; dinner Tue-Thu, Sun 5:30pm-9:30pm, Fri-Sat 5:30pm-10pm; and brunch Sat-Sun 11am-2:30pm. 1 Main St. (near Sulphur Springs), St. Helena, 707-967-4695.